Barnett Banks of Florida, Inc.
Home > Banks and Insurance > Banks, Brokers, Exchanges A - D > Barnett Banks of Florida, Inc. 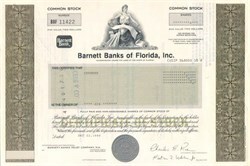 Beautifully engraved certificate from the Barnett Banks of Florida, Inc. issued in 1986-1987. This historic document was printed by the Security-Columbian Banknote Company and has an ornate border around it with a vignette of an allegorical woman holding scroll. This item has the printed signatures of the Company’s Chairman/President and Secretary and is over 14 years old. Barnett is a multi-bank holding company established as a Florida corporation in 1930 and is registered under the BHCA, with its principal asset being the stock of its subsidiaries. Barnett offers a comprehensive line of banking and related financial services to retail and business customers in its primary markets of Florida and southern Georgia. .
Barnett, through its bank and non-bank subsidiaries, engages in retail financial services, commercial banking, trust and investment management services, indirect auto lending and leasing, mortgage lending and consumer finance. Barnett is organized and managed through three major business groups: Asset Management, Consumer Credit and Business Banking. Barnett's Asset Management group serves the money management and related needs of customers, including deposit accounts and services, mutual funds, annuities, trust services, insurance, brokerage and private banking products. These products and services are delivered primarily through Barnett's retail delivery network, consisting of 640 banking offices and 1,046 automated teller machines ("ATMs") throughout Florida and southern Georgia. Barnett Bank, N.A. is the principal bank subsidiary of Barnett. The Consumer Credit group offers products and services from mortgage to automobile loans and leases, home equity loans, credit cards and education financing. Barnett provides these services through its banking offices as well as nationally through its wholly-owned subsidiaries: EquiCredit Corporation, Barnett Mortgage Company, Dealer Financial Services, Inc., Loan America Financial Corporation and Oxford Resources Corp. The Business Banking group meets the needs of companies of all sizes by providing financial services ranging from small business loans to international banking to capital market products. The group also offers non-financial products such as employee leasing, payroll and discounted telephone services.